Opening in February 2019, Octave 9 adds a flexible performance venue to Benaroya Hall. Featuring a modular surround screen and responsive video and acoustics, it stretches the boundaries of creative possibility. Today the Seattle Symphony unveiled plans for Octave 9: Raisbeck Music Center, a new venue at Benaroya Hall slated to open in February 2019. Octave 9 reimagines the former Soundbridge Seattle Symphony Music Discovery Center at the corner of Second Avenue & Union Street through the nexus of technology and design, creating a versatile, immersive environment for inventive performances, education opportunities and community engagement. Construction will begin in June 2018. Combining a modular surround video screen with 13 moveable panels, 10 ultra-short-throw projectors, motion-capture cameras, and a state-of-the-art Meyer Sound Constellation® Acoustic System with 42 speakers and 30 microphones, the technology in Octave 9 can create a 360° shared virtual experience or disappear into the background for a more traditional setting. Octave 9 seamlessly transforms to become a performance space, meeting room or interactive classroom, adapting the structure of the space and the acoustics to suit any needs. In addition to transforming to the needs of a specific performance or activity, Octave 9 ensures that each visitor’s musical experience is tuned to perfection, no matter where they are in the room. This musical experience is achieved through Meyer Sound’s Constellation® Acoustic System. With the touch of a button, Constellation will transform the acoustics of Octave 9 from a 50-seat cozy lounge to the spacious sound of a concert hall. A series of custom system presets will provide supportive acoustic environments for a variety of ensembles, and additional presets can be customized by musicians to meet any need, empowering a limitless range of possible acoustic environments. The system’s SpaceMap® spatialization and Wild Tracks™ playback will provide the opportunity for artists to place sounds anywhere around the environment, opening the door to innovative sonic exploration. “The Meyer Constellation® Acoustic System removes the need to physically shape the space for controlling acoustics which allowed for the creation of a highly flexible space that can be digitally tuned to a wide variety of performance conditions. Throughout the project, LMN Architects leveraged parametric modeling to coordinate the variety of consultants and systems that occur within the space in order to deliver a design that goes beyond the typical high-tech black box studio,” added Scott Crawford, Principal, LMN Architects. Musical performances will be further enhanced by the visually immersive capabilities of the venue itself. 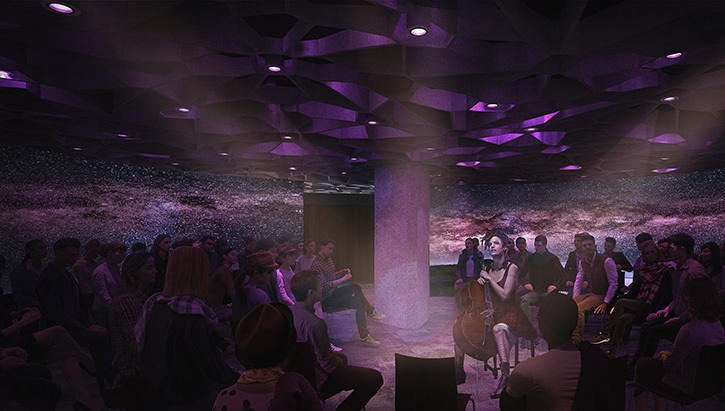 Octave 9 transports musicians and audience together through a customizable, 360° projection surface, allowing artists and musicians to visually transform the space into virtually any environment, further enhancing the multi-sensory experience. The acoustics and visuals in Octave 9 are integrated through an interactive system of motion-capture cameras connected to high-definition, short-throw projectors. The surround video can be programmed to respond to the motion and sound in the room — creating a multi-sensory environment and a shared virtual experience. The technology is integrated into the design of the space through a custom ceiling designed and manufactured by LMN Architects. The asymmetrical complex of honeycombs conceals an array of microphones, speakers, motion-capture cameras, projectors and LED-lights. In Octave 9 a broad range of creative residencies and performances are possible, leveraging the embedded technology to push boundaries and pioneer the future of musical experiences. Starting in February 2019, the Seattle Symphony will invite composers, musicians and interdisciplinary artists to explore the venue as a creative tool. Derek Bermel, the Seattle Symphony’s 2018–2019 Composer in Residence, will be the first to curate a series of concerts and community experiences in Octave 9. Taking advantage of the technology in the space, Bermel has been commissioned to compose a new work for Seattle Symphony musicians to premiere in Octave 9 as part of his residency. Cellist and experimental artist Seth Parker Woods will become Octave 9’s first Artist in Residence in the 2019–2020 season. Woods will begin his relationship with the Seattle Symphony during the 2018–2019 season, performing with the Seattle Symphony in the community. He will continue in the 2019–2020 season with multiple creative projects in Octave 9. During his residency, he will premiere a number of new works for cello and multimedia commissioned by the Seattle Symphony from a diverse group of composers and visual artists. In addition to Seattle Symphony creative projects, Octave 9 will serve as an artistic incubator, welcoming our community and local artists to take advantage of the venue’s unique capabilities as a small chamber music hall or experimental performance environment. Additional programming and ticket information will be announced in October 2018. The former Soundbridge opened in 2001 as a vibrant musical classroom for students, families and underserved communities in the Puget Sound area. Part exhibit and part classroom, the interactive space welcomed more than 10,000 children and families each year for concerts, community workshops, student recitals, guest lectures and other activities. Soundbridge closed in the fall of 2016 and many of the activities were temporarily relocated in preparation for construction. Building on the history of Soundbridge, Octave 9 will continue to be a home for the Seattle Symphony’s community and family programs, expanding to serve approximately 28,000 visitors each year. Leveraging the technology and design of the venue, Octave 9 will provide a platform to pioneer new experiences that deepen learning and access for youth, families and schools across the Puget Sound region. In addition to new opportunities, Octave 9’s transformative visual and sound capacity will enhance existing community, school and family programs which have previously taken place in Soundbridge, including Sensory Friendly Concerts, the Merriman Family Young Composers Workshop, Community Compositions and the Lullaby Project. James and Sherry Raisbeck are generously matching every dollar contributed to the Octave 9 renovation project, up to $2 million. Please consider a donation to support this important project today! To learn more about opportunities to support this project, please contact Associate Vice President of Development Renee Duprel at renee.duprel@seattlesymphony.org or 206.215.4764. The $6.7 million capital project is funded through a combination of public and private funds, spearheaded by a $2 million match from local philanthropists James and Sherry Raisbeck. Support for Octave 9 comes from the 4Culture/King County Building for Culture Program, Norcliffe Foundation, Apex Foundation, Paula Boggs and Randee Fox, Children Count Foundation, Joshua Green Foundation, The Tagney Jones Family Fund at the Seattle Foundation, LMN Architects, and Meyer Sound Laboratories, Inc.
Benaroya Hall, including Octave 9 (formerly Soundbridge), is owned by the City of Seattle and is operated and maintained by the Seattle Symphony under a lease agreement. The city also has invested funds to help make Octave 9 possible and preserve an important public asset. We would like to thank our project partners: LMN Architects; Meyer Sound; Jaffe Holden; Schuler Shook; Belle & Wissell, Co.; JTM Construction; Holaday-Parks, Inc.; Sequoyah Electric, LLC; Karass Creative; and Magnusson Klemencic Associates.